Pastor Yohanna Buru, founder of the Peace, Revival and Reconciliation Foundation, hands the organization's donation to a prison officer at Kaduna Central Prison. Christian clerics in Kaduna, Nigeria, this past week distributed food items to prisoners and underprivileged people to mark the start of the holy Muslim month of Ramadan. Leaders said this was part of an effort to promote peace between the two main religions in the region. For the last couple of years, members of the Peace, Revival and Reconciliation Foundation have visited prisoners in Kaduna to distribute food, soap and other items to Muslim inmates and pay fines for those serving short sentences. Buru said his organization wants to break the boundaries that divide groups along religious and ethnic lines and bring them together. He also said that as he's done for the past four years, he had secured the release of four inmates who were incarcerated for lesser crimes. "We don't want to break the tradition. ... Every year we are releasing Muslim prisoners for Ramadan fasting," he said. The pastor noted that some inmates were not guilty of any offense but were in jail because of failures in the country’s judicial system. Abubakar Haruna, 23, walks free from Kaduna Central Prison after the Peace, Revival and Reconciliation Foundation paid his fine. 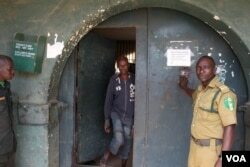 Abubakar Haruna, 23, one of the four prisoners released Thursday, had been in prison for three months. He said he was arrested when police could not arrest his friend who stole an earring. Haruna said he was happy that Buru had helped him get out of prison, and that with the first day of Ramadan, it was an excellent day for him and his life, thanks to God. Buru said people like Haruna need help regardless of their tribe or religious affiliation. He argued that these types of gestures would foster peace and unity in the country. In 2014, the Peace, Revival and Reconciliation Foundation secured the release of six prisoners. Group members say they want to get even more prisoners out so that they can help to build a peaceful city, state and country.